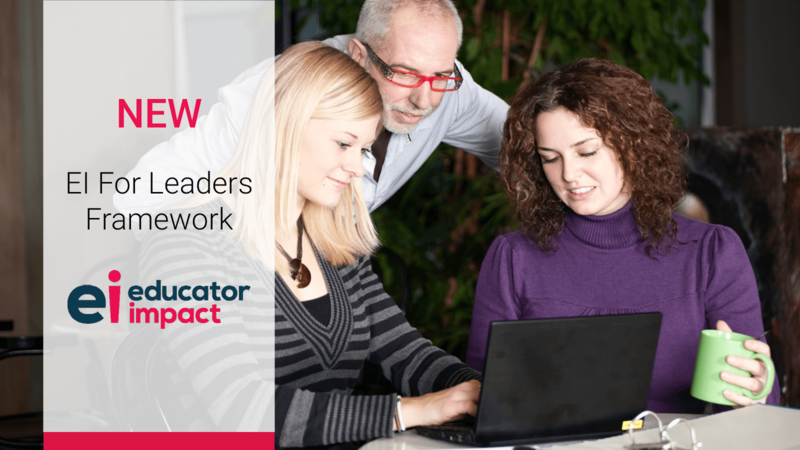 We are excited to be launching the new EI for Leaders Framework. We have had many schools ask us for more specific support and guidance for their leaders and emerging leaders. The EI for Leaders Framework will allow leaders to embed a culture of feedback in their schools. Furthermore, it will help their leadership teams enhance their effectiveness. EI for Leaders aims to help school leaders grow. Its method is to provide leaders with feedback and clear suggestions for achievable behaviour changes to make them better leaders. EI for Leaders is fundamentally about change and growth. We believe that feedback is key to personal growth. As Ken Blanchard famously wrote in the One Minute Manager “feedback is the breakfast of champions”. We could not agree more and our guiding principles for EI for Leaders has always been about enabling action. We believe that like any learned skill, leadership is best improved by breaking it down into constituent elements so that they can be individually understood, analysed, critiqued, practised and, ultimately, improved. As such, we are less interested in lengthy academic discussion and needless definitional argument about what traits or styles of leadership enable leaders to be better leaders. We are much more interested in school leaders being the architects of their own improvement. Therefore we have designed a framework that on the one hand is built from the ground-up through focus groups, interviews and user feedback while on the other is sculpted from the top down. Using historical experience, inspiration from behavioural, transformational, and other theoretical leadership insights and engagement with the literature of debate on school leadership. Underpinning all of this are the behaviour principles of simplicity, action over theory, and incremental change in a safe and supportive process. For more information about EI, or to learn more about how we combine our 360-degree teacher feedback, self-reflection, evidence-based goal setting and evaluation functions into one streamlined tool, please do not hesitate to contact us today.